This spring, commuters trapped in New York City’s notoriously delayed subway found themselves surrounded by colorful ads for the roommate-matching startup Roomi. Plastered all over train cars and the walls of well-trafficked stations like West 4th Street, they depicted millennials engaged in the daily struggle of New York living. “Find a roommate who is OK with paying a little extra for air conditioning,” read one, next to a drawing of two melting figures. “Find a roommate who also had a panic attack on election night,” read another. It was the kind of campaign that bigger, more familiar companies like Streeteasy, Seamless and Casper are known for, and it seemed to cement Roomi’s status as a company on the rise. Founded by a young, charismatic immigrant and backed by $17 million in venture funding, the startup hoped to shake up New York’s apartment market the way Tinder had transformed dating and Airbnb hospitality. These ambitions took a big, perhaps terminal, hit last week, when the company said it would lay off the majority of its staff after a failure to secure more funding. Former employees and sources close to the company say the subway ads are part of the reason why Roomi is now in trouble. They cost more than $1 million and were part of a culture of reckless spending and nepotism at the startup that ultimately left it short of cash, these sources say. 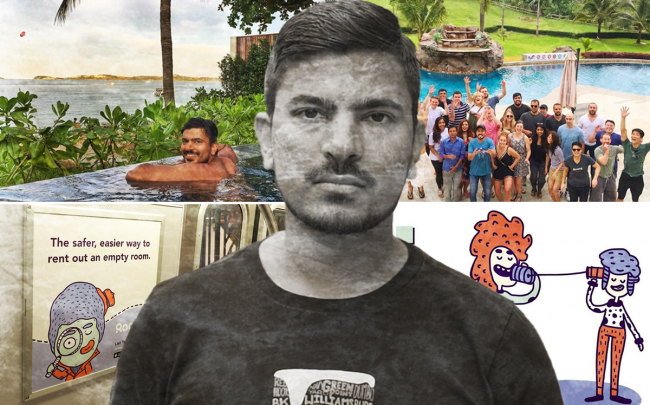 Roomi’s founder Ajay Yadav flew the company’s employees to Thailand for a retreat, hired his fiancée, sister, brother and cousin, and allegedly used company funds to pay for a $1,500 suit, a private trip and his dog’s insurance, among other cases. Every startup has its founding myth. Roomi’s goes like this: When Yadav, now 30, moved from India to the U.S. for college, he struggled to find roommates. So he decided there should be an app for that. He began working on the idea in 2013 and formally launched Roomi in 2015. The idea was to let people create profiles for themselves and their apartments, and match roommates through an online platform that’s safer and easier to use than Craigslist. Yadav wasn’t the only one who had that idea. A number of other startups, some with similar names, offered the same product. But Roomi quickly distinguished itself as the best-known and best-funded roommate-matching company. In March 2017, it raised $11 million in a Series A round led by Atami Capital. Its backers include Citigroup executive Dan Keegan, former Trulia president Paul Levine and Global Switch CEO John Corcoran. The company went on to acquire several peers and last year Yadav made Forbes’ “30 under 30” list in the consumer technology category. As late as last Friday, CNN published a fawning profile of the company, and Roomi’s seemingly sudden implosion on the same day was a shock to some outside observers. But it didn’t come as much of a surprise to several ex-staffers and investors who, on condition of anonymity, described a pattern of lavish spending and misuse of company funds. Beyond the subway ads, Yadav pushed through several acquisitions over the past few months that were roundly criticized by his team. Between March and August, the company bought Symbi, Study Abroad Apartments and Dada Room, which was based in Mexico City. Several former staffers said they thought buying Study Abroad Apartments was misguided since it had a different business model. But the Dada deal had more serious financial implications because Yadav agreed to retain several of the company’s employees despite the fact that they couldn’t speak English well enough to communicate with the rest of the team. His excessive spending didn’t stop there, sources said. Yadav allegedly bought a $1,500 suit for himself on the company dime, expensed meals for himself and his fiancée and even used company money to purchase pet insurance for his dog, a black-and-white schnoodle named Caleb. In November 2017, Roomi took about 30 employees on an all-expense-paid trip to Thailand that cost around $80,000. “In retrospect, it was a kind of sad and crazy attempt to buy people’s respect,” said a former employee who went on the trip. Zach Aarons, co-founder of the real estate tech investment and accelerator firm MetaProp NYC, said entrepreneurs sometimes struggle to distinguish between legitimate and illegitimate spending. A source familiar with the company’s finances said Roomi’s burn rate was $9 million a year, including payroll, which was around $500,000 per month earlier this year. Yadav allegedly gave cushy jobs to family members in the U.S. and in India. His fiancée, Britt Chantel, was paid $3,000 a month even though she didn’t actually work for Roomi, according to several sources close to the company. Yadav’s brother, sister and cousin worked in Roomi’s India office — which several ex-staffers thought should be shut down altogether because it wasn’t cost-efficient. The fact that they were all on staff was no secret. But those who confronted him about the nepotism or his use of company funds were regularly fired or forced to quit, multiple sources allege. “When you’re at $20 billion you can start to play around with that, but when cash is tight, employing your entire extended family is not normal,” the investor said. Several ex-staffers aired their grievances on Glassdoor, where they described Yadav’s temper tantrums as well as nagging uncertainty about Roomi’s revenue stream. “If you like how Donald Trump runs his cabinet, you’ll enjoy working at Roomi,” read one review, posted in May. Roomi’s finances are somewhat opaque. Even though the company had raised $17 million from institutional investors, the startup launched a crowdfunding campaign in October 2017 seeking up to $1.07 million. In regulatory disclosures filed with the Securities and Exchange Commission, Roomi listed assets of $2.4 million at the end of the fiscal year 2017. It also reported $37,890 in revenue that fiscal year. But in its pitch to investors on Republic, the crowdfunding site, Roomi projected revenues of $750,000 in 2017 and $5 million in 2018. As of March 1 of this year, Roomi had secured just $321,555 from 1,080 investors on the crowdfunding site. Comments posted on Republic reflect some of the investor skepticism. Others questioned why Roomi needed the campaign at all if it had the backing of VC funds. 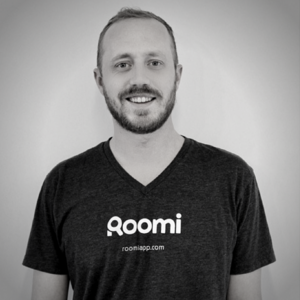 “It’s a bit unorthodox,” COO Alex Larsen wrote in response to one such comment, but said the idea came from family and friends who wanted to invest in Roomi but couldn’t because they weren’t accredited investors. “For us, crowdfunding provides an opportunity for these folks to invest and become part of our journey,” he said. But by early this year, several former employees said Roomi was running low on cash. Sources said in March, Yadav tried to put a positive spin on things, telling employees that he’d secured $10 million. During interviews with prospective hires, he told a similar story. Other real estate tech-focused startups have recently ceased normal operations and laid off staffers after failing to secure funding. RealtyShares, which has $63 million in VC backing, is one such example. Sources said the crowdfunding company would stop investing and lay off a majority of its staff after a last-ditch effort to sell the company didn’t pan out, The Real Deal reported Wednesday. Early this summer, Yadav told employees Roomi had enough money to get through July. At the time, he was on a mission to raise $10 million in what he called a Series A extension. “He called it an A1, like the steak sauce,” one former employee said. 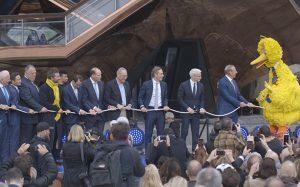 Even as Yadav was scrambling for a lifeline, Roomi moved into a flashy new office in the Flatiron district this fall. Days before laying off most of Roomi’s team, Yadav was still pitching investors.